Skinflint Sunday: Always kill two birds with the one stone. Today, despite the heat, I threw Poppy and Jeff into the car and we went and signed up to dog obedience. We ended up doing the introductory class – all three of us together. The kidlets were surprisingly good, though a 30C morning may have had something to do with it. Unfortunately they both got put in the same class (White 1) which means that I’ll either have to tip water over a child to wake him up in time to get to Sunday’s classes, or I’ll have to take one pup on Wednesday night and one on Sunday. The real reason I’m doing this is for Poppy. I’ve had many a Cavalier over the years and she’s the most intelligent one I think I’ve ever owned. Jeff’s more your “I love you let’s have a cuddle” kind of guy, whereas Poppy’s more your “Give me a task to do and I’m happy, or else I’ll chew your shoes” kind of girl. Jeff needs more people to love and Poppy needs mental stimulation or I’ll have to go to work in ugg boots. I’m looking forward to this. Jeff surprised me with how quickly he picked things up and they both loved it. I think this’ll be a nice way to kick off our Sundays. Thermomix recipe: Moroccan pasta She says it’s quick, tasty and cheap. Hits all the buttons for me! 3 Responses to Skinflint Sunday: Always kill two birds with the one stone. 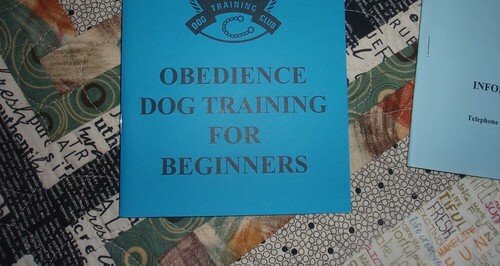 So important to do some obediance training. Unfortunately we have a history of taking the first dog, then never getting around to it for the second….have done that twice now and consequently we always seem to have one quiet, obedient dog and one terribly cute, ratbag dog. I do like the look of that quilt in the first photo too…..